There are two kinds of people - Good guys, and bad guys. Ivan is as bad as they come. He bullies children, doesn't pay his rent, and now has nowhere to live after threatening his landlord. I'm not selling it or anything, it's totally free to read! I would like to purchase this comic. How do I do this? Must be a pain to have to do re-draws after writing the whole thing again! But writing is definitely super important, so if you get that right, the rest will follow. I've got a lot on my read list, so it might be a while before I get to bungou stray dogs, but I'm looking forward to it nonetheless. Alright! Hahaha, and I might take a little longer now, because last night I rewrote the whole thing. Everyone that reads it says that it held their interest in a way none of my other ones have, so I'm excited, buuuut I have to start over drawing. Shouldn't be that bad though. Damn, sounds like you're making really quick progress! I'm gonna be able to read this sooner than I think! Well, you make this series sound pretty cool, and I'm always looking for new things to read, so I'll add it to my list, and will let you know what I think! Yeah, good point. Hahahaha, well I get enough sleep just at the wrong times. I am super happy though, I've never drawn so fast before. I'm almost twenty pages in! Drawing the last one took me like six months! I'm really excited for it. Hahaha, you should read it! It's one of my absolute favorites, and it's super intense! It's seinen, and the character designs are really amazing! Plus there's that emotional commentary thing that manga has a lot... Really puts a lot in new perspective! It's great! But yeah, manga is a seriously amazing medium, and there's nothing quite like it. It's awesome to get inspired and being unable to tear yourself away from the drawing table, but don't burn out! No trouble! Your critiques are always really detailed and insightful, and they help me to see the flaws in my work that I'm probably just blind to. I've always been terrible at writing girl characters, but I never thought you would have the same problem! Guess we both have to keep working on it. Good luck with Volume Zero and I look forward to your next critique! I am really, really happy that the critique was helpful- it's nerve wracking to leave, and I'm no expert, but if it helps then I'm glad! I hope you get to keep creating, even if it's not as much as you want! I hope that I'll post the next Volume Zero before summer... I started drawing but I'm really trying to make it look how I want, so I've been taking fooorever! Thank you for looking forward to it! Of course! I always enjoy reading your work! I'm sorry you won't be able to spend time on manga for a while- I never like hitting those points in life. But hopefully you'll get to be back at it at full force soon! I'm glad my critique was helpful- and I'm not at all surprised that you already planned to fix a lot of those things! If you're planning one with a more modern feel, I'm reaaally intrigued as to how it will turn out! Girl characters are just difficult, man. I don't know how my guy characters come across to people, but I'm sure it's weird or girly at times since I'm not a guy. Even so, I don't find girls any easier to write! They're hard! Hahaha, but it's a real strength to see in your own manga what exactly went wrong! I'm sure that you'll hit the nail on the head as you keep those things in mind. And for the success thing, I'm glad you mentioned it, because I'm often racking my brains trying to figure out why the things I draw don't seem to interest people at large. Since the last two one-shots were 'lone-wolf' type stories, I think you're right about that being out of style these days. I definitely wasn't planning on keeping this trend up for the next one-shot, and I have a couple of ideas already centered around younger, more school-age characters that I think would give the work that more modern shonen feel. I've had a great time making these two one-shots, but I have honestly no idea when the next one will be. I've reached a point where for the forseeable future I can't give much time to manga, so the next one could be months away, could be years, I'm not sure yet. But I'll always keep drawing and will do my best to improve! I look forward to seeing the next version of Volume Zero, and thank you so much for all your help Nagisa. On another note, Michelle is one of things I was talking about when I said I thought this one had 'writing issues'. From about page 16 onwards, her personality has been completely dissolved, and she reverts to a simple damsel in distress. That's my fault since I couldn't find a way to incorporate her personality into the later part of the story. I'll also freely admit that I'm not so great at writing female characters (I'm not a girl so it's harder to relate to them I suppose), so I'll practice that a bit more. Thanks so much for all the feedback Nagisa, it's really helpful! I thought the idea of the main character being a genuine "Bad Guy" is relatively underused, so I wanted to see what I could come up with, and I'm glad you liked it! Character was definitely the main focus of this one, and it seems like that went over well with you. For the record, I 100% agree with you about the panels. Nine panels per page is just cluttered and overwhelming, and it never feels good, but as you guessed - I couldn't get the story to fit within the page limit otherwise. For the next one, I'll work on making the script shorter to give the pages more breathing room.
. Anyways, I loved this oneshot, and I think you're really improving! I think that your art is the thing holding you back the most at this point, but even that keeps improving with every oneshot! So if you want to keep in mind the things I've said, then awesome! I can't wait to read your next one! Like, as examples, an informant who supplies jobs that is equally as strong but much more mild, or much more lighthearted than your mc, who supplies endless banter and arguing. Or the guy who taught your mc everything he knows but the mc always calls him "old man" and threatens to beat him up, even though he knows his mentor is stronger. These are cliches for sure, but if you just make that perfect opposite for your character who the readers can latch onto as a window into the mc's good side- even if he doesn't have one, then his begrudgingly-allowing-this-comrade-to-exist-side- and he will be more likable and reachable to us. This, plus eventual improvement in your art, will definitely boost your manga. And maybe you could do some anatomy or form studies to get that rapid improvement in your art. Most manga readers I see have moved on from basic shonen, and you can see jump taking their magazine a different direction too. The battle should be there, the fierceness and power and action, but there's always a climb the character has to face- and a long running struggle. Something unique and relatable. Yours aren't boring, and the mc isn't unlikable or without struggles and goals.... So maybe you could experiment next time with the friends he surrounds himself with, or is forced to interact with. I think the manga world HAS moved on from lone-wolfs, and even though you have other characters, there's no one I feel your mc's care about as equals. Side note: Your humor is just so good. Right up my alley. I laughed a lot reading this, seriously. That's a matter of taste, but I don't see how others couldn't see the humor. Okay, the sister was funny and a great driver of the plot, and we get some development on her end too, but there are some moments that feel a little cliche with her. She is a girl, and your dialogue usually is sooo "guy-ish" so this might be a more difficult aspect, and not one most people might care about. SO take this with a grain of salt. It was enough to notice but did not decrease my enjoyment for a single second, so do with that what you want. I'm trying to say everything I can. Okay, compliment sandwich- the art is flashy, the character designs are consistent, and there's good use of screen tone that adds to it. Your art is still developing, but the anatomy is improving, and the perspective and world building is too. So just keep working on that- you use big, flashy panels focused on characters, and then pages with a lot of small panels, and with the sound effects and speech bubbles it doesn't leave a whole lot of room for backgrounds, so if you pull out the camera a bit more you'll get a lot more fluidity out of the art, and some more room for the backgrounds. It's good to see where everyone is. Not the most important thing,obviously. I think you have a good grasp on that, and the better you get at backgrounds the less that'll matter. Now, the concept of his punch is SO FRIGGEN COOL MAN!!! I am definitely not a huge action buff and "powers' are never the reason I read any manga, but I adored that concept and what drives it. It's so character motivated- having to connect with a strong emotion- watching him use that was an immediate character development because we get to latch on to his strongest emotion- and I really feel like you made it count. There are a lot of great things I'm seeing, and the ending had impact on me. Now I'll start dissecting some cons! You always have strong character writing, and because of this there are always interesting bits of dialogue that resonate with me. "Like I didn't quite add up in his eyes" was one of my favorite lines this one- there's so much that says, and it's a very specific way of expressing a common sentiment among characters like this- that whole parent-hatred thing, but this line is so unique and feels exactly like something IVAN would say. Does that make sense? It's so him. There are others, but this is evidence to great character writing, and it really makes the humor punch you in the funny bone. Sanks! I put this tags, but I'm gone in among the participants(Why? I want too!But hoa i can do it? Hi there! 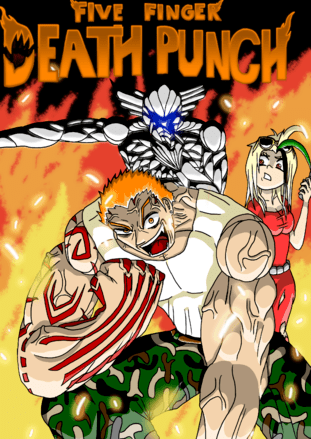 Yep, I've entered it in the 2nd MCPO manga competition! Hello!How did you publoshed your manga for competition?